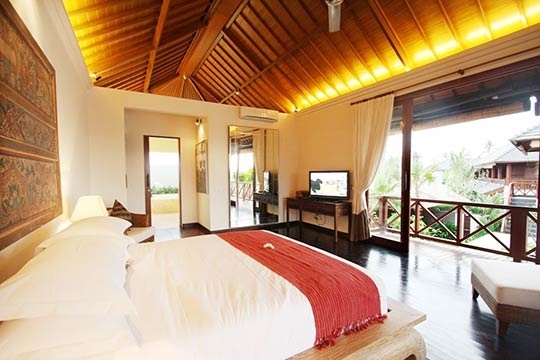 Four large bedrooms, a choice of living and dining areas, a full team of staff, and a 13m swimming pool await guests at Villa Kipi. 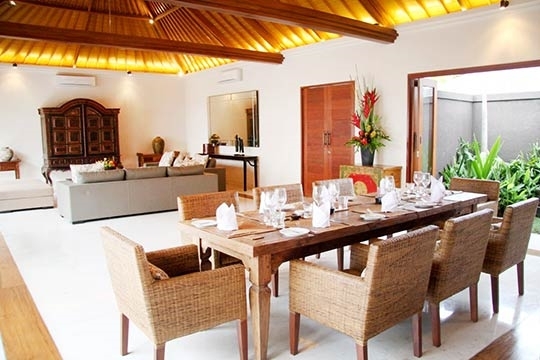 Offering excellent value, the property is situated on a secure private estate 200m from the beach in the up-and-coming neighbourhood of Batubelig, near Seminyak. Villa Kipi, with its 13m swimming pool, ticks all of the above boxes, and it’s marvellous use of space makes it great value for money. In addition to the four bedrooms, which include a huge master suite bordered on two sides by a broad balcony, the villa offers a delightful choice of areas – indoors and out – for living and dining, which means there is always somewhere to escape to should you so desire: curl up with a book in an open-air lounge, eat breakfast or lunch in an alfresco dining pavilion, doze on the sundeck, swim in the pool, or socialise in the air-conditioned living and dining room with its big-screen TV. 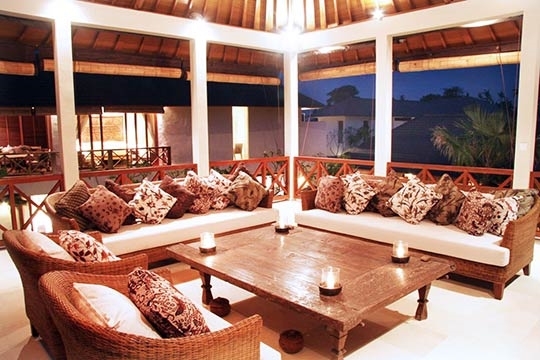 The other major selling point for Villa Kipi is its location. You may not yet have heard of Batubelig, but it’s one of Bali’s most up-and-coming beachside scenes, bordering both Seminyak and Canggu – separated from Canggu only by a river but linked by the beach or a small road bridge. 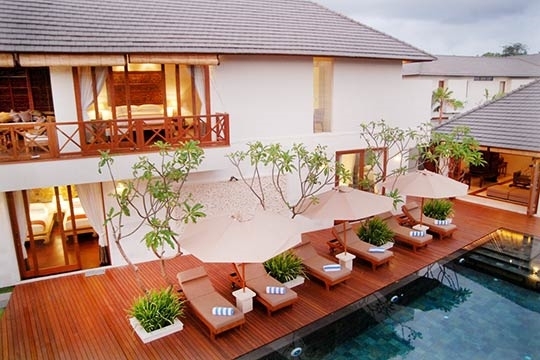 From Villa Kipi’s safe complex, which is guarded day and night by a security team, it’s only a two-minute stroll to the beach or five minutes on foot to one of Bali’s most eminent restaurants and beach clubs. Alternatively, five minutes’ walk in the other direction will bring you to three of the island’s most popular restaurants. Finally, Villa Kipi’s team of staff, including an affable manager who also fulfils the role of cook, is on hand to look after your needs. A comprehensive suggestion menu is available and the staff will do all of the grocery shopping at cost price (plus 20% to cover transport and service). The villa is ideal for groups of friends, and would also work well for families (bring your own toys). 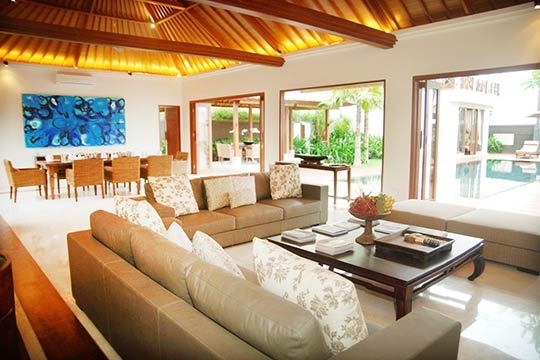 Villa Kipi is excellent value for money and offers a really generous amount of space and a great close-to-the-beach location within a secure gated estate. Nice as it is, we felt that Kipi lacks soul and character and is more generic than unique in terms of style. However, it’s furnished well with some nice antiques and comfy sofas and beds. The timber decking beside the pool is in need of maintenance, and as of June 2013 there was still some building construction going on next door but we were told that should be completed within a few weeks, so just check before booking. 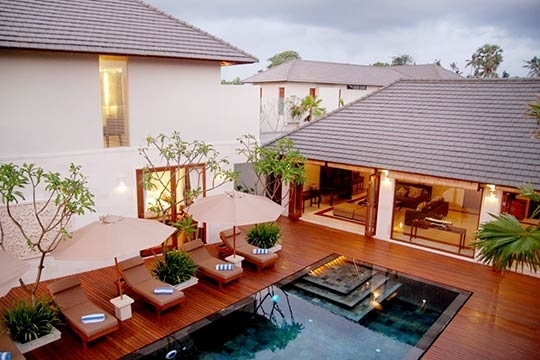 As part of a gated estate of private villas on the border of Seminyak and Canggu, Villa Kipi has the best of both worlds on its doorstep. The Batubelig area is an up-and-coming destination and within 500m along Jalan Batubelig is a whole slew of small restaurants and cafes, spas, a couple of convenience stores and boutiques. In the other direction is the beach; the less built up part where walking and playing is a joy. The beach is patrolled by lifeguards so it’s okay to swim between the red and yellow flags, and there are a couple of beachside table setups serving cold drinks and snacks. Here you will also find the wonderful Mozaic Beach Club and gourmet restaurant. Upon entering the villa, you will find yourselves in an expansive, marble-floored living and dining room, which features a high roof and folding glass doors all along one side, which open wide to the swimming pool. Everything in this air-conditioned (and fan-cooled) room is big, from the huge antique cabinet, which rests at one end and houses a large cable-channel TV and DVD player with surround-sound, to the giant wall mirror, a pair of long, comfy leather sofas, a coffee table and two ottomans. At the other end is an antique dining table for ten, situated next door to the modern kitchen well equipped with an oven, a four-burner hob, microwave, fridge, and a range of utensils. An alternative dining venue is situated outside beside the pool at a circular table for six in a spacious open-sided pavilion where wooden pillars support an alang-alang thatched roof. This is a great spot for enjoying an alfresco breakfast or lunch. The villa is comprised of two more pavilions, both of which are double-storey, with the pool taking centre-stage, surrounded on all four sides by a broad timber sundeck. One of the buildings features an open-sided fan-cooled living room situated on the upper floor, accessed via an external stone staircase. Under its soaring roof, the Palimanan stone floor is furnished with two deeply cushioned rattan sofas, a pair of rattan armchairs and a coffee table. One of the villa’s four bedrooms is positioned on the lower level, while three more bedrooms are housed in the other two-storey building. 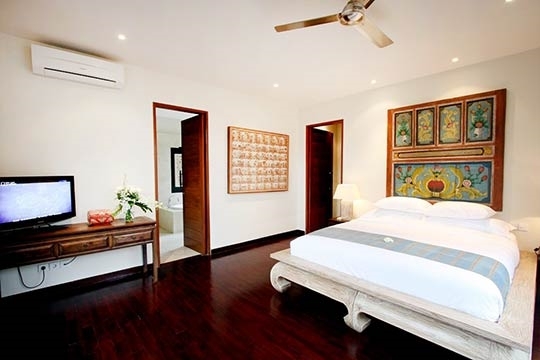 Each bedroom has a wooden floor, a ceiling fan and air-conditioning, a cable-channel TV, either walk-in or fitted wardrobes and a queen-size bed. 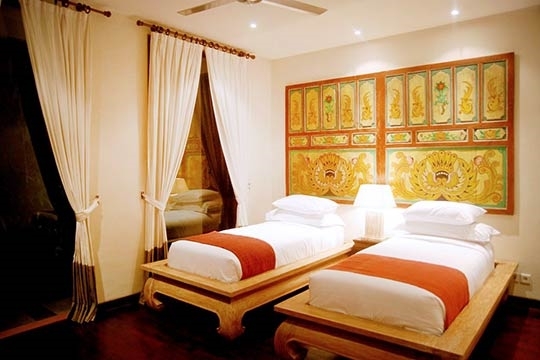 Decorative features include antique painted wall panels. 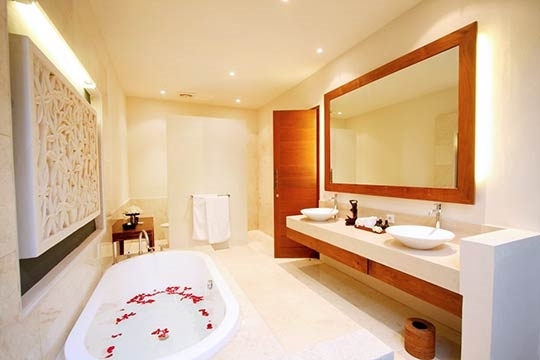 The fresh and airy bathrooms are fitted with twin washbasins, bathtubs, and showers. 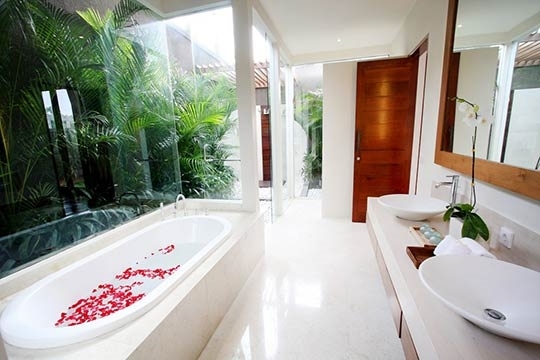 Three of the bathrooms have an indoor monsoon shower as well as an outdoor shower. 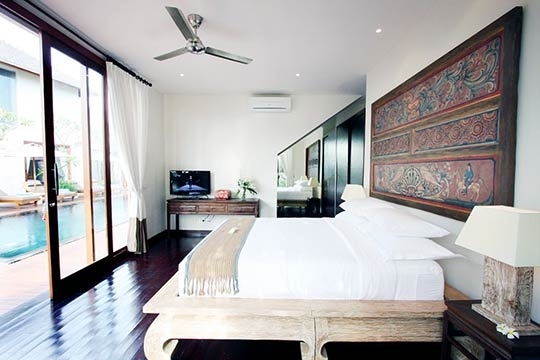 The master suite covers the whole of the upper floor of the largest building. It is equipped with TV and a DVD player, and additional furnishings include an armchair and a lazy chair. On two sides of the suite is a delightful balcony-deck furnished with a cushioned daybed, two chairs and a small circular table. The shower in the master bathroom has a glass door that can be opened to a small outdoor area for an alfresco experience. 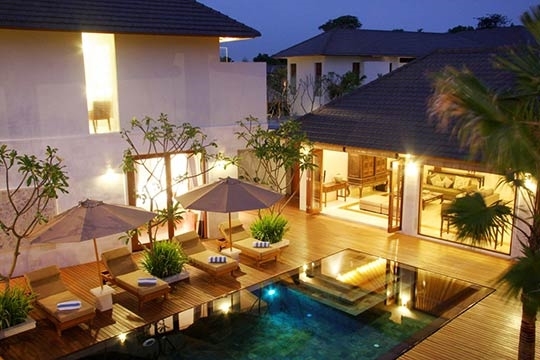 4 bedroom villa located in Canggu, Bali. Ideal for Beach in ten, Body and soul, Going for golf, Fair share for groups, Sensible for seniors.